High on and off-road vehicle performance for optimal evasive manoeuvrability. Retention of OEM vehicle exterior and features. 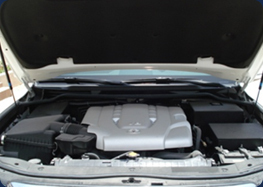 The above will Increase the vehicle durability and reliability, reduced maintenance, servicing costs and downtime. Advanced IED blast protection through integration of interlocked pieces of large armuring panels, maximizing the strength of the armouring material. Most of the armoring panels are installed in an overlapping layout to eliminate any gaps in the armoring. Full 360 degree "bullet catcher" overlaps systems installed in all vehicle openings, from top to bottom. Strength of vehicle cabin reinforced by interlocking large pieces of armoring panels, acting as a vehicle roll cage. Minimized welding and bolting points prevent collapse of armoring panels in the event of an explosive attack. Vehicle chassis, suspension are upgraded with heavy duty and high performance components to accommodate the additional armoring weight. Armored engine and fuel tank protect essential vehicle components, ensuring vehicle functionality for evasive maneuvers. Ballistic steel cut and bent to exact armoring specifications using CAD and precision laser technology. Advanced machinery and skilled technicians enable Orient to manipulate large pieces of ballistic steel without compromising the chemical properties of the material, as opposed to welding small pieces together. All armoring panels on each side are interlocked and overlapped, firmly secured to the chassis to reinforce the cabin to provide superior blast protection. 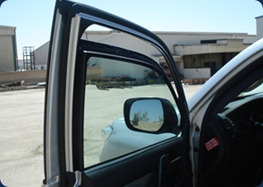 Full Armoring overlaps (from top to bottom) with customized door panels to defeat ballistic threats from all angles. Ballistic glass panels are fully secured in armored "U-channel" frames to provide overlapping protection. In the event of a blast, the overlaps are designed to reinforce the armored doors and glass to remain in the frame, preventing it from being dislodged by the pressures of the blast. Ballistic glass able to defeat more rounds - all our transparent armoring is rated to defeat three rounds fired in a 70mm triangle, a tighter group than the CEN requirement of 120mm triangle. Orient transparent armoring is rated for a wide operational temperature range and features integrated spall shields to minimize delamination and shattering. Additionally, the transparent Armoring is rated for a high operational temperature range and features integrated spall shields to prevent the ballistic glass from shattering and delaminating. Orient offers upgraded suspension and braking packages to improve the armored vehicle performance and handling. Slotted brake discs improves gas ventilation to minimize overheating of the braking system and brake fade. Other upgrades such as heavy duty brake pads are available to further increase the performance of the braking system. 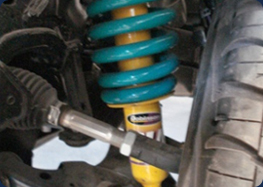 Upgraded Dobinson or equivalent coil springs and shock absorbers are designed for the weight of the vehicle after armoring. In addition, advanced adjustable systems with external oil reservoir further improve the vehicle handling dynamics and performance in both on- and off-road environments. All our armored vehicles are equipped with run-flat tires, enabling the driver to maneuver the vehicle to safety even if the tires are punctured. 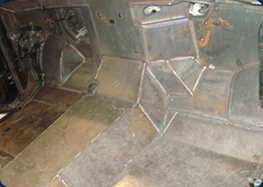 Our Armoring design & Process integrates interlocking vehicle body armoring panels that act as a roll cage and increase chassis rigidity to provide rollover protection. Heavy duty hinges and nylon strap buffers are installed on all doors in order to ensure proper alignment and increase operational lifetime. 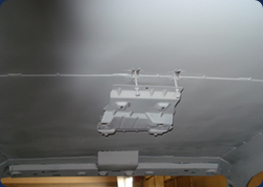 All interior protrusions such as rivets are minimized to prevent injury to occupants. By reinforcing the chassis, Orient armored vehicles provide superior blast protection with a strong armored cabin that is integrated to the chassis so that the armoring will remain intact. 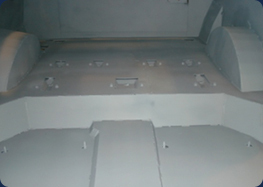 The shape of vehicle firewalls is typically complex and very difficult to armor. Most manufacturers are forced to weld numerous ballistic steel plates together to form the shape. Welding small pieces of ballistic steel together compromises the properties of the material, which weakens the integrity of the firewall and reduces vehicle survivability against explosives such as IED attacks. With advanced technology and techniques, We are capable of constructing the firewall armoring using large pieces of overlapped ballistic steel to minimize welding points to form a significantly stronger armored firewall with no gaps. Orient armored firewall is designed to remain intact in the event of a blast, preventing any shrapnel from entering the cabin. In addition, if the firewall is constructed with multiple small pieces, they may be loosened by the shockwave of the blast and become projectiles that may harm the vehicle occupants. Protecting key engine components is crucial since a disabled vehicle cannot evade be driven to safety. All Orient armored vehicles are equipped with ballistic steel protection over the battery, ECU, fenders, behind the headlights, the master cylinder and the fuel tank. Armoring these essential components of the vehicle ensures that the vehicle remains drivable to perform evasive maneuvers during an attack. In addition, we also offer optional upgrades such as secondary cooling fan and air scoop(s) to enhance engine cooling and front and side radiator protection specifically engineered for optimal air flow.